Like many raptor species, the male and female Lizard Buzzard look exactly the same. The only difference is that the female is slightly larger. 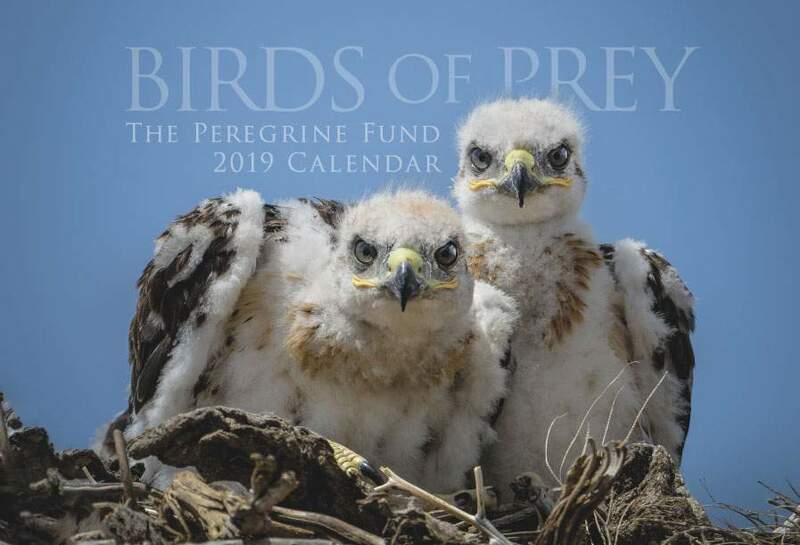 Though The Peregrine Fund doesn't work directly with Lizard Buzzards, our efforts in scientific research, habitat conservation, education, and community development help conserve raptors around the world. We also supply literature to researchers from our avian research library, which helps scientists around the world gather and share important information on raptor conservation. The Lizard Buzzard lives in Sub-saharan Africa and can be found in such countries as Angola, Ghana, Togo, Nigeria, Ethiopia, Burkina Faso, Somalia, Botswana, Zimbabwe, Swaziland, and South Africa, to name just a few. Though this lovely hawk seems to prefer to spend its time in moist, wooded savannas and woodlands along rivers, it can also be found in a wide variety of other habitat types including secondary growth forest, clearings within forests, urban gardens, thickets, palm groves, and pine plantations. Though not a migratory species, the Lizard Buzzard does make seasonal movements throughout southern Africa. It mainly moves from moist woodland areas in the breeding season to more open and arid woodlands in winter. The Lizard Buzzard is a relatively small hawk and is quite beautiful, indeed. Its head, back and upper breast are a lovely slate grey. It has a white breast lined with thin dark grey bands. Its chin is white with a dark black line running down the center. It has dark eyes and its cere and legs range from bright orange to red. Its wings are pointy and relatively short. The Lizard Buzzard can often be seen perching on trees, telephone poles and wires. It soars most often in late mornings. Even though the Lizard Buzzard is spread over a wide range and is considered of Least Concern, it doesn't mean this small raptor doesn't face some serious threats throughout its range. Loss of habitat, electrocution by powerlines and poisoning may soon take their toll on this species. However, scientists don't know enough yet about how the Lizard Buzzard will adapt, or fail to adapt, to all of these changes. The good news is that its main prey items remain relatively abundant - even in human-altered habitats. This is a bonus that might help the Lizard Buzzard survive in the long term. 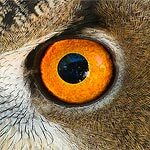 If you had to guess what a Lizard Buzzard likes to feed on most, you might be tempted to say "lizards." But don't let this hawk's name fool you. Though it does feed on lizards, and other reptiles such as snakes, most of its diet constists of insects. Grasshoppers, beetles, scorpions, locusts, termites, centipedes and even beetle larvae are all on this hungry hawk's menu. But the list doesn't stop there! It also hunts spiders, frogs, rodents, birds, and crabs. The Lizard Buzzard is quite a good hunter, and has learned to make a kill while expending the least energy possible - taking a "sit and wait" approach to every meal. It usually hangs out on a low, exposed perch, watching as potential prey crawls, slithers, hops, walks or flies by. When the buzzard spots an animal or insect that is exposed, or that has its guard down, the Lizard Buzzard strikes! It dives quickly from its perch, most often catching its prey on the ground. Scientists believe that Lizard Buzzards are monogomous - meaning the same male and female will stay together for life. Both parents will work together to build their nest which is made up of small sticks and lined with soft materials such as dry grass, leaves, and pieces of lichen. The pair prefers to build the nest in the fork of a forest tree. When the time is right, the female will lay between 1-3 plain white eggs. At this time, the male and female will help take care of their future nestlings, but in different ways. The female will be responsible for incubating the eggs - which means she must sit on them for most of the day, making sure they stay at just the right temperature in order for the young embryos to develop into healthy baby chicks. In the case of the Lizard Buzzard - this development takes about 33 days! While the female is incubating, the male has the very important task of bringing her enough food so she can concentrate all her attention on the eggs. After the chicks hatch, they are fluffy and covered in down. It will take them another 40 days of eating, sleeping, growing and pooping before they are developed enough to take their first flights. Both the male and female work hard to take care of their young, feed them and protect them from predators. After only 3 months or so, these young birds will have learned just about everything they can from their parents and they will become fully independent - hunting, dispersing and surviving all on their own. The World Center for Birds of Prey offers fun ways to learn about raptors. Interactive activities, tours, interesting videos and a children's room with activities from coloring sheets and quizzes to costumes and a touch table are available for the curious mind. We also have several different birds of prey on display year-round. 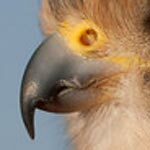 Come for a visit, where our knowledgeable staff and volunteers are on hand to answer any questions you may have about Lizard Buzzards or other raptors.